BREAKING: District Court Judge Rules Oklahoma’s Marriage Ban Unconstitutional! It’s not surprising that the decision has been stayed, considering the fact that the Utah case is currently stayed pending appeal and will likely go to the 10th Circuit, which has jurisdiction over both Utah and Oklahoma. 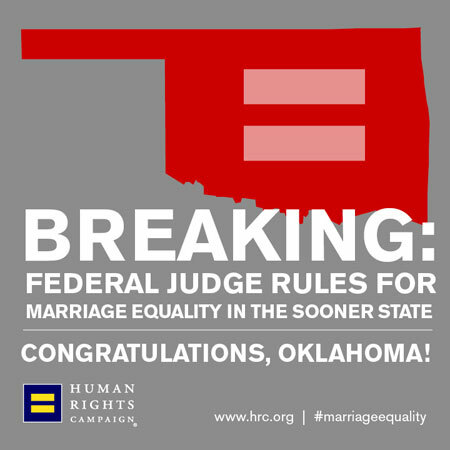 Today U.S. District Judge Terence Kern ruled that Oklahoma’s ban on marriage equality is unconstitutional. His ruling is stayed pending appeal, meaning marriages will not occur immediately in the Sooner State. Like Truth Wins Out on Facebook HERE and follow me on Twitter HERE.